FNB and Absa have reportedly notified the controversial company that their accounts will be closed. South Africa’s major financial institutions have formally notified African Global Operations – better known by its previous name Bosasa – that they will be terminating the hugely controversial facilities management company’s accounts, according to a statement from the company. The banks have reportedly cited reputational risk as their reason for cutting ties. Bosasa’s statement confirms that they will be liquidated and that banks had sent them formal notification of the closure of their accounts. The company says the banks’ decision to “distance” themselves from the group has led them to decide to announce “voluntary liquidation”. They say their treatment by the banks was “occasioned by negative media reports” which caused them “extensive reputational damage”. eNCA reported on Monday morning that the company has now appointed a liquidator and plans to go into voluntary liquidation as a result of the banks’ decision, which will result in 4,500 job losses as well as the termination of roughly 3,000 contracts. News24, meanwhile, say they received confirmation that FNB and Absa have contacted Bosasa informing them their accounts will be terminated. The Citizen called and left messages with Bosasa’s Papa Leshabane, who had not yet replied at the time of publication. The move by banks is similar to their treatment of the Gupta family, also implicated in allegations surrounding state capture. The country’s four major banks – Absa, FNB, Standard Bank, Nedbank – cut ties, citing reputation risk and possible breach of banking rules. Absa was the first to shut down the accounts in December 2015. India’s Bank of Baroda followed suit in January 2018 after allegations surfaced that the bank’s South African branch laundered money on behalf of the fugitive family. The move by the banks angered supporters of former president Jacob Zuma – who enjoyed close ties with the family – accusing banks of trying to shut down legitimate black-owned businesses. It was reported in January that Bosasa, which was investigated for corruption by the Special Investigating Unit, built a ”war chest” in case their accounts were liquidated. The company is believed to have transferred millions of rands from the attorneys’ trust account to its operations in case authorities froze its bank accounts, according to former CFO Andries Van Tonder’s testimony at the state capture commission of inquiry. “Watson said this was done to mitigate against the risk of running out of funds in case of possible freezing applications to banks by the NPA [National Prosecutions Authority], because of the SIU matter… Watson said this would be a war chest for Bosasa,” Van Tonder testified. Former COO Angelo Agrizzi wrote an email in June 2016 to Bosasa attorney Brian Biebuyck requesting him to transfer R25 million from the trust account to Bosasa operations. 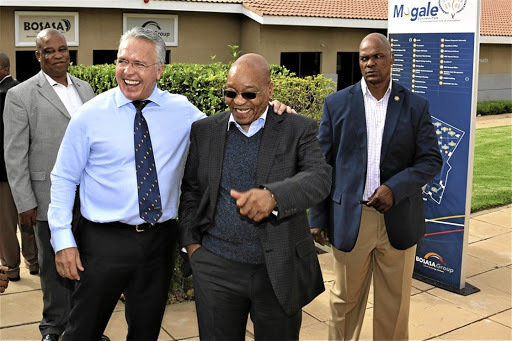 Agrizzi wrote that Bosasa would replace the R25 million once it received an R85 million payment due from the department of justice, said Van Tonder. It is with deep regret that the Board of Directors announce the voluntary liquidation of the AFRICAN GLOBAL OPERATIONS Group of Companies. We received formal notification from our financial institution of the decision to distance itself from the Group and as a result the closure of all the entities bank accounts on or before 28 February 2019. To avert a situation whereby the Group would not be able to further operate as of the 1st of March 2019, AFRICAN GLOBAL Group Board applied with various financial institutions, locally and internationally for a trading account. The extensive reputational damage in the past few months, occasioned by negative media reports, has resulted in financial institutions determination that the AFRICAN GLOBAL Group poses a reputational risk for them as clients. The decisions made by the financial institutions are not based on the AFRICAN GLOBAL Group’s liquidity status, financial stability, operational performance or growth forecasts. On the contrary, the Group is both factually and commercially solvent. Tragically, the Group will be unable to trade without a Bank account. In consultation with various legal teams, industry specialists and in accordance with the obligations imposed by the Companies Act 71 of 2008, the AFRICAN GLOBAL Board was advised that the obligation inter alia states that if it is foreseeable that a company will not be able to pay creditors, as payments fall due within the next six ensuing months, the company has an obligation to either enter into Business Rescue or Voluntary Liquidation. The devastating ripple effect on suppliers and contractors is unparalleled as the group has in excess of 3100 suppliers; many of whom are small businesses dependent on the work received from the Group. The 32 Creches in Orange farm that the Group is supporting with early childhood development initiatives and numerous other projects. As AFRICAN GLOBAL Group of Companies we have been unique in our service offering. We have been leaders in various sectors and contributed to the improvement of service delivery in South Africa. This we did by serving our clients with the best standards and futuristic solutions. We have made a substantial positive contribution in different of society where our teams have operated. We confirm that nowhere and no one has reported that we have failed to deliver quality service to our clients. We always met/exceeded our client’s expectations. Credit must go to our outstanding, hardworking and loyal staff who unfortunately, through no fault of their own, face an uncertain future. Our vision has always been to provide service excellence and in so doing, impact and change the lives of thousands of people, for the better. We have accomplished this, and it is a fact that cannot be refuted. This work will forever remain and will not go unnoticed as an indelible legacy transforming lives for the better. As the current leadership of AFRICAN GLOBAL, we abide in the knowledge that during this process of liquidation, many lives will continue to be transformed for the better and that as we move forward, we will witness yet the dawn of a new era. We furthermore wish to take this opportunity to thank all our stakeholders for the invaluable journey, experiences, memories and a purpose driven future ahead. In conclusion, we focus on the future and move forward in the knowledge that as a society, we will all continue to build a better future for all. UPDATE: Bosasa’s statement added 10:12 on February 18.